My hubby and brother are both skinny but like it or not they are going to be subjected to Low Carb Italian Meatballs. 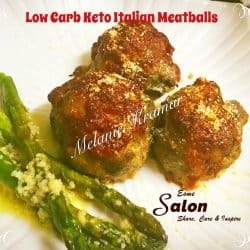 😊 Tonight I made Low Carb Italian Meatballs. I prepared mash for them, I had mine with garlic butter asparagus. They absolutely loved it! Preheat the oven to 220 ˚C. Now, you line a baking sheet with parchment paper or foil (grease if using foil). In a large bowl, stir together the grated Parmesan cheese, golden flaxseed meal, Italian seasoning, sea salt, and black pepper. Next, whisk the milk, grated onion, egg, garlic, and fresh parsley. Let the mixture sit for a couple of minutes. Mix into the ground beef mixture using your hands, until just incorporated. Please do not over-mix the ‘beef mixture’ as you will end up with tough meatballs. Form the mixture into balls and then place it on the lined baking sheet. Bake the meatballs for ±10-12 minutes, or longer depending on the size you make them until the meatballs are barely done. If you want them more golden, you can place them under the broiler for a couple of minutes. Next step would be to top each meatball with some marinara sauce. Return to the oven and bake for another 3-5 minutes, until the sauce is hot and meatballs are cooked through. Garnish with additional fresh parsley.